Bring all new flavors to your specialty drink menu with this Torani classic caramel flavoring syrup! This tempting flavor will complement your beverages without overpowering them or being too sweet, while the user-friendly bottle will be convenient for your busy baristas to use. Torani flavoring syrups are specially formulated to resist curdling in milk and to hold up well under heat, making them the perfect choice for espresso-based drinks, brewed coffee or tea, and more. Use this flavor for frappes, iced coffees, smoothies, and even baking! Our customers love having these syrups available to flavor their coffee. We also use them in some buttercream flavors. The caramel is very popular with our customers. What can you say about caramel flavoring that hasn’t already been said? It’s delicious. I recommend buying at least 6 bottles at a time and get the discount. You’ll definitely go through them. A nice way to sweeten and flavor coffee, lattes, etc. at the same time. The caramel flavor is not very natural tasting and leaves a bit of an after-taste. I will explore Torani's other caramel offering to see if another suits my tastes better. Smooth caramel flavoring that comes through in our coffees and lattes. Mixes in well and blends well with our frozens. The taste is great and not overwhelming. This syrup has a rich flavor. It gets sold out very qucikly at our shop. We are always reordering it! It has a great taste that goes very well with coffee. There are 2 types of caramel flavoring syrups of Torani. This one is named as Classic Caramel which is mostly carrying strong tones of caramel. Definitely a house favorite. We use this caramel syrup in lattes, cappuccinos, cold brew and more. Really tasty and true to the flavor. We also use it to drizzle on desserts. This is the only syrup Torani makes that I cannot give a 5 star review to. We tried making a caramel macchiato with this syrup and there was no caramel flavor, compared to the caramel Ghirardelli sauce. We've tried adding it in as a sub for drinks that don't need much caramel, and it still doesn't work. This syrup is not strong enough to overpower anything with espresso in it. We sadly have a great many bottles to find a way to use, and I just can't force it on my customers. Classic Caramel syrup that gets a 10* ... free of artificial ingredients and preservatives and exactly what our customer love in our coffee shot! A few shots to any drink really enhances the flavor and gives it an authentic taste. You cant go wrong with about any Torani flavor. We use this caramel syrup in our iced coffees and our frappuccinos! They are so good. Torani is a very good brand and their quality is very high! I can't say enough about the entire line of Torani flavoring syrups. Caramel is one of our all time best sellers, so having enough of these on hand is critical to our ice cream shop. And you can't beat the price here after shopping around for them at local distribution centers. We have had a few leak issues in the past, but the company is always resolving it by sending a new product immediately. Definitely recommend! 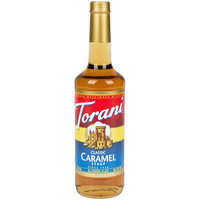 We use this Torani Classic Caramel Flavoring Syrup very often at my cafe and it adds the perfect touch to our coffee! I would definitely recommend this product. WebstaurantStore always has fast shipping and is consistently reliable! I'm always cautious with syrups because they always taste off. Except for this one. Nailed it. I used it to make homemade ice cream. As a rule of thumb, Torani flavors are really good. This caramel syrup is perfect to blend in our house made frappes. It adds an extra caramel kick to our Twix or caramel frappe drinks. The torani classic caramel is the perfect syrup for our caramel frappes! Our customers love the rich flavor and how distinct in taste it is! Great buy! Great taste! Perfect for a caramel macchiato. Would recommend to someone looking for caramel to add to coffee or any other drinks along that line. Torani Caramel is one of our top selling syrups for coffee! The thin consistency makes it blend in with any drink and doesn’t leave any type of after taste. So classically caramel! It is just perfect. It makes amazing lattes, iced coffee and frozen drinks. We mixed it with apple to make a caramel apple frappe too. What a delicious syrup. It had a nice and strong flavor. My only recommendation is to go easy on it, as in only use one or two pumps per drink. It is definitely a good value though for what you get that. The flavor of this syrup is pretty disappointing, it was too artificial for my taste buds. The cookie dough syrup is my favorite out of the Torani collection. The Flagship of my coffee shop. The flavor is incredible. Many times I use this as one of the ingredients to fancier coffee drinks I offer. Our customers love Torani flavoring syrups. The Classic Caramel flavor is delicious and blends well into creamy thick milkshakes and hot, iced or frozen coffees. When having a coffee shop caramel is a must! I'm pleased with this classic caramel. It has a higher quality flavor than other brands I've tried. We use this in our coffees, lattes, and cappuccinos. You can mix with other flavors or just by itself. Tastes great. Our customers love it! The Classic Caramel syrup is one of the top selling flavoring syrups for our lattes, caramel macchiatos and even in the coffee. A nice flavor. Caramel flavoring is very helpful in the coffee business. It's often not necessary to overuse expensive caramel sauce for many beverages, when this syrup has a full body flavor and has a much lower price point. Popular in many hot and cold drinks. I love using these coffee flavoring syrups. They are good in hot coffee, ice coffee, Italian sodas, even to flavor baked items and for buttercreams. We use this for our coffee shop. Torani and WebstaurantStore combined make the perfect pair when it comes to pricing. The caramel flavor is good and easily a 5 Star product. When trying to please a crowd, you can't go wrong with caramel flavoring, and when it comes to flavoring syrups, you can't go wrong with Torani! This caramel syrup is a staple that every coffee shop should have! This syrup is especially good in lattes, however, it tastes great in pretty much everything! Caramel coffees are one of my favorite flavors. They are addicting and I'm glad that I can find the same syrups my local coffee shops use on webstaurant. A quality product. Customers like it at our coffee and tea shop for flavoring various espresso drinks. The price is right and our customers really like it. This product is great. It is an amazing value. Even after paying for shipping it is much cheaper than any where else that we have purchased it before. Caramel flavored coffees are one my weaknesses. I was thrilled when I bought this brand and tasted it. It was fabulous. The syrup blended well into my latte and tasted great. Great addition to our food & coffee options. Flavor is perfect for drinks and customers love it. Will buy many more. Very happy with purchase. A must have for your coffee selection. It is a very popular flavor with my customers. They mix it with all my others flavors! Great in a cup of hot coffee. Amazing syrup, perfect for carmel frappe's. I especially enjoy this in my cold coffee. Would recommend to my friends. I found out about this at coffee shops. This is our favorite flavor from this brand. We always have a bottle of this available to go with coffee we make from our Jura machine! We like to leave this in the fridge after opening. Absolutely delicious. The syrup itself is more liquid then thick syrup, which I was not expecting, but it still tasted perfect. You only need one to two pumps in a 16 oz cup of coffee for the perfect flavor balance. It does however have a LOT of sugar in it. The Torani line is not our preferred product, but it is a good price. The caramel is pretty good and tastes comparable to some of the more expensive products. Torani Classic Caramel syrup tastes like real caramel and id great for adding flavor to a variety of food and drinks such as coffee and icings. I love the Torani 750 mL Classic Caramel Flavoring Syrup in my cappuccino. It is even better topped with Whipped Cream and a drizzle of Torani 16.5 oz. Caramel Flavoring Sauce. I love the vast varieties that Webstaurant store has. Buying from Webstaurant Store saves me time and money. This coffee flavoring is great...This is one of my staples. I was very impressed with the packaging and the very quick delivery of my order. The caramel syrup really makes the drink's flavor pop out at you when you add this in with the thicker caramel syrup from Torani. We use it daily. We use the classic caramel flavoring with our espresso drinks. The caramel flavor is a tasty compliment to our lattes and mochas. It is fairly sweet. This product has an authentic caramel flavor. We use it in many of our flavored coffe drinks. This is a very popular flavor. Will continue to use. this is the first time we use this brand of syrup, and it doesn't make me disappointed, it taste really good caramel. costumer loved it. this is a good sauce and some of my barista's really like it however I prefer the thicker caramel sauce to this liquid form. I do recommend it though for applications were you need a thinner sauce especially for mixing. This product is amazing! I love the sweet caramel flavor. It is a great addition to coffee or a latte. The glass bottle was packaged wonderfully. Very strong caramel taste, but I still tend to prefer the sauces over the syrup. Either way, this caramel flavor is great for use in drinks. This syrup has excellent flavor and is makes the perfect lattes. it also pairs well with other flavors and doesn't overpower them. I love this caramel syrup. This torani classic caramel syrup tastes just like caramel. It goes great in coffees, but it also good when making homemade icecream. Torani has a great line of products and I highly recommend them. Syrup makes for great tasting cappuccinos and lattes. These bottles are large and offer many servings of the mentioned drinks. The classic Carmel Flavor is rich and powerful brining you the best taste possible. Allowing you to offer favorite drinks. I was over dispensing "real" caramel out of a jug through a pump so I decided to try this and what a massive improvement. Huge time saver and tastes just the same! Our customers absolutely love the taste of this caramel syrup added to their coffee, lattes, etc.! We can't keep it stocked quick enough! Love this product! This is one of my favorite syrup, the caramel flavor is not over bearing, it's just right . I recommend giving this a try, you'll love it too! We looked everywhere to get this flavor. It arrived nicely packaged and makes a perfect addition to our bakery for iced coffee or hot coffee. You will need the pump to make this very efficient. be sure to buy in bulk or this makes no sense to purchase. You need to get that sweet spot and reorder and save on freight with reoccuring purchases. Of course works great. Caramel bottle came with dried, crystals of syrup down the side, but the bottle does not appear to be opened or cracked. Not sure what happened. The bottle came wrapped in plastic so if it was to leak, it wouldn't get all over the rest of my order. I bought multiple bottles and they were packaged nicely in a case together. The price can't be beat! We use these for our flavored specialty drinks and flavored hot/ iced coffee. They work great and have good flavor that come at a great price. Delicious classic caramel flavor. No cracks in bottle. Solid packaging. Well protected. Shipped and received quickly. Easy to use and the price is quite fair. These are absolutely delicious. It's a to choice amongst our customer in the morning. The texture is nice and the taste flavorful. We highly recmmend. We love the Torani brand of syrups. We are able to purchase them here through Webstaurant and have access to all the flavors. It is a savings even with shipping! For the caramel lovers this is the coffee flavoring for you. It smells great, tastes awesome and comes in a glass bottle. Will order more. Love this syrup! It's one of our most popular ones. Such a great true caramel taste that sweetens any type of drink. Whether hot or cold! Perfect classic caramel flavor. Perfect to add to coffee and lattes, hot and iced. Also use in baking. Gives the perfect flavor to homemade desserts. Torani did it again with this flavor. The classic caramel flavor is always a delicious addition to the milkshakes we have in our store. Very smooth taste, pours well, and is a very good price. I love using this in my morning lattes! It tastes so smooth and creamy. My favorite by far. All my friends love it as well. This syrup is a great combination for coffee , coffee drinks this don't last long in my shop , we love all the flavors ! Great classic caramel syrup for any beverages. It fits perfectly with a tablecraft coffee syrup pump. I am satisfied that the product arrived undamaged. I will definitely order one again. Great tasting flavored syrup. We love Torani and their products/ We will definitely buy this product again. The caramel flavor is needed for coffee especially. I bought this for coffee. It is perfect for a my candy bar coffee. I can't wait to use it this week end at my next event. Classic Caramel has a rich caramel flavor without being too sweet. This goes great in hot or iced coffee and its tasty in hot chocolate. Torani has some really great syrups. This tastes just like the stuff offered at those expensive coffee shops. I am able to make my own iced coffees with caramel syrup for much less than what I'd pay for iced coffees there. Very good flavor profile and it tastes just like caramel - not fake tasting at all. I used this product for an ice coffee program in a private high school. This product is our second most popular flavor addition and works well in all warm beverages. This is a great syrup to use for your morning latte! We heat up a cup of milk, add 1 oz of Torani Classic Caramel syrup and 2 shots of espresso. Gets you going everytime! This is really great, not just for adding flavor to your coffee hot or cold, it is also great for baking, flavoring desserts and I even use it in cupcakes as well as the frosting for the cupcakes. This is great quality and flavor. You will not be disappointed! 1 downfall is this comes in a glass bottle and for someone like myself that is clumsy, or has kids, I wish they were plastic. However the plastic may change the flavor. Catch 22! Great tasting syrup for making winter time drinks like caramel apple cider. The lid will get crusty so buy a pour spout to stick on the top instead. I switched to the Torani syrups because they are cheaper than previous brand. None of my customers have noticed the difference. I will be ordering more of these syrups. Another staple at our coffeeshop. Always popular in coffee, either hot or iced. It also great used in an alcoholic hot apple cider. A little Captain Morgans, a little caramel syrup added to hot cider, topped with whipped cream and cinnamon. Delicious! Our best seller! all our customer rave about the flavor of caramel in their caramel lattes and cappuccinos. Whether it is cold or hot this is great! By far the most popular Torani syrup flavor we carry. Works great mixed with lattes, cappuccinos, hot chocolate or even straight coffee. Always seems to satisfy. Caramel is a must have for any coffee barista and this delicious caramel by Torani is sure to please. Will purchase again and again at this price! We use this syrup a million times a day (slight exageration). It is a staple in our coffee house. It is super good in our "sugar daddy" latte. This stuff is a great complement for any warm drink like hot chocolate. In fact, I think its added so much to our hot chocolate drinks whenever we add this flavor. Very satisfied with this product. This product is absolutely amazing! I never dreamed I would l would love it as much as I do. I use it every day and my family does as well. Excellent!